Let us valet your cars whilst you and your clients or delegates enjoy your event, lunch or your corporate day. 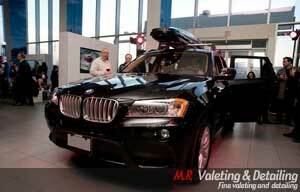 M.R Valeting can offer valeting services to the event, promotions market, product launches or corporate days. We can provide experienced car valeters who would remain at the venue and valet your cars. We could charge your company a flat rate if you wish to offer this as a free service to your clients or we could charge your clients wishing to have their car cleaned on the day (minimum booking required). No matter what kind of promotion or corporate event you have in mind, give us a call on 0800 955 2599 or contact us to discuss your requirements.